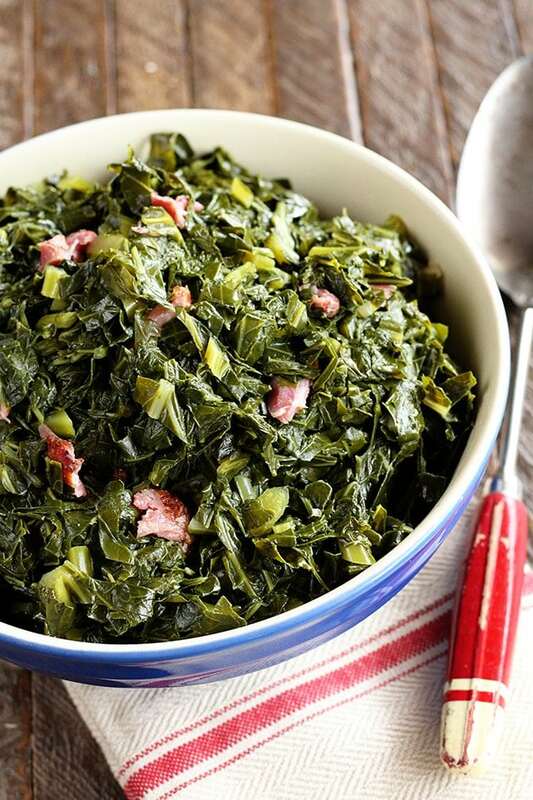 southern collard greens with ham…mmm! This is a post I wrote more than 6 years ago. I’ve updated the photos and tweaked the recipe just a smidge. Hope y’all enjoy! 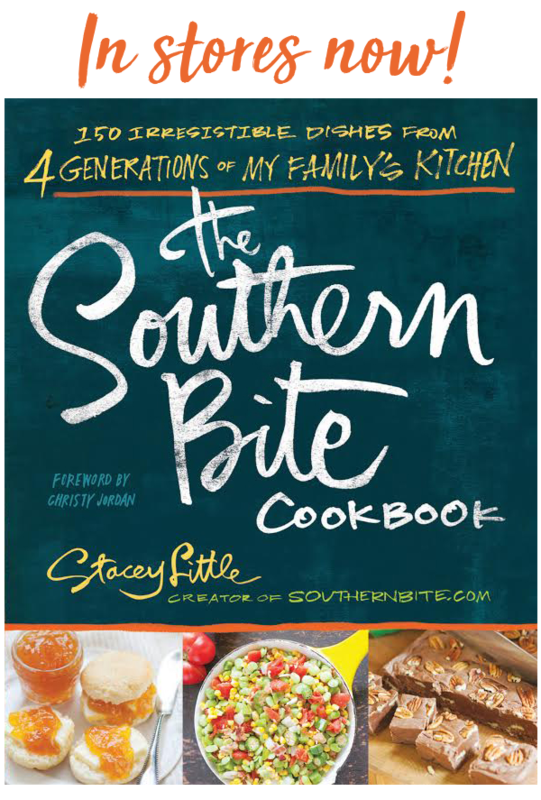 When folks think of the South, I imagine they’d think of Southern food – things like okra, cornbread, grits, sweet tea and southern collards greens! Those are all things that a true Southern cook should know how to prepare. Oddly enough though, I’ve found that many folks are scared of greens. Not only in preparing them, but eating them too. 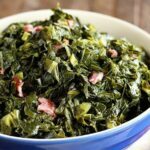 For me, southern collard greens are just about my favorite vegetable. I’ve been told that when I was little, I would turn down a bowl of ice cream for a bowl of collards and some cornbread. It’s funny too, because at the end of the season, my grandfather would harvest the remaining leaves and pull up the collard plants and I would take the plants and go plant them in the backyard only for them to grow more. It’s true, I might have an obsession with the leafy green. In fact, I grew my own this year and was able to cook my first mess just this past weekend. 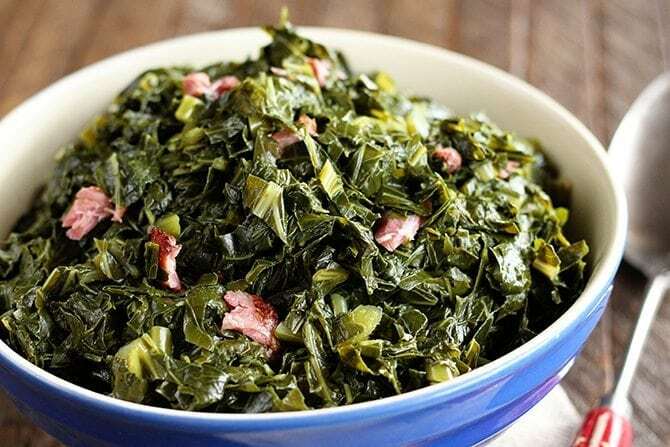 Now for me, collards are not southern collard greens unless they are cooked with a smoked ham hock, bacon just won’t do it. And I don’t care a lick about collards that have sugar in them. Just not my thing. Here is a SUPER easy way to make some of the best southern collard greens you’ve ever had. In the words of my great-grandmother, they might even make your tongue slap your brains out, so beware. Let’s talk a little about what goes into this. You can certainly buy a bunch of collards at the farmers market or grocery store (and I urge everyone to do it at least one time) and cut and wash them yourself. You can also take the convenient way out and buy a 2 pound bag of the pre-cut, pre-washed kind. It’s a HUGE time saver and is so much easier. If you’re interested in what a ham hock actually is click here. But I’d just advise you not to worry about all that and use it anyway. 🙂 Y’all enjoy! Combine water, ham hock, bullion cubes, salt, garlic, and onion in a large pot and bring to a boil. Carefully add collards allowing them to cook down a minute or two to allow the rest to fit into the pot. Cover and cook for 1.5 to 2 hours, stirring every now and then, or until the collards are tender. When ready to serve, stir in the vinegar. If you'd like, remove the ham hock and shred the meat. Return the meat to the greens and serve. I have eaten collard greens for over 50 years and I have to say … these were some of the best collard greens I have ever eaten. I like collards better than turnip greens but make sure you get the thick stems off. To me turnip greens are dainty but collards are robust. I agree completely! You do need to get the woody stems off, but the softer stems are my favorite part! after cooking this way — fry a little fat back,transfer greens to frying pan. use forks and drain water back into pot before transfer. fry,cut up a little bit with fork and knife–kinda shortens the stems!!! shouthern folks–will fry!!! I have collard greens waiting in the garden, now I know what to do with them. Must go buy some ham hock though! Perfect! And yes, it’s worth getting the ham hock! You can probably find it in your local grocery store without much problem. I use smoked neck bones! Me 2! Smoked turkey is the best! Love the collard greens. I had never thought of adding the chicken bullion cubes or the garlic clove. Must try those additions next time. It makes a big difference in flavor! Sounds delish! Love me some cornbread and pot liquor! Is it necessary to add the salt? I can’t have salt so I’m hoping the other ingredients will flavor the greens or should I use a salt substitute? Recipe looks so easy and I really want to make it. I would certainly say that it isn’t necessary. There is plenty of flavor in there with the bullion and the garlic. Try it without, you can always add a salt substitute at the end if it’s not to your liking. Try Uncle Wileys Greens Seasoning. Google it and enjoy. I grow my own collards. Oh…just the recipe I needed for this weekend! Love collards! Good luck, Tina! Happy New Year!! My husband likes mustard greens. So, that’s what I cook. I thought the recipe, above required TO MUCH salt.. 2 tablespoons? I don’t use NEARLY that much. I like to saute some ham that contains a little bit of fat along with onion. Then I add the greens, vegetable broth and season. I’m a big fan of almost all green leafy vegetables! You know what they say about tastes. 🙂 I find that when using 3 quarts of water, the salt amount turns out just about right. But as with ANY recipe, you can change it to suit your taste. Happy New Year!! Hmmm… well, I’m just not too sure. It shouldn’t make a huge difference except for salt. I’ve seen estimates that claim that a bunch is about 1 pound. All I can say is THANK YOU….The recipe was quick and easy but most importantly the flavor was so good. I added seasoning salt and onion flakes to the water and allowed them simmer 3 -4 hours. Sounds delish! I’m so glad they turned out good for you!!! This is almost exactly how I have always prepared my collards. Exceptions are that I go ahead and use canned chicken broth instead of the bouillon and water, and I have not yet tried it with garlic. I’ll give that a try next time! I pull the meat off the hock when it’s done, shred and chop it, and add it back to the greens. This recipe converted my daughter’s in-laws in PA to greens and now they grow them too! The garlic just kicks it up a notch. Enjoy! Good luck! I bet you’ll like them! I have never had collard greens but have acquired a taste for kale (ex was from MD), so I am going to have to broaden my horizons. I also love a smoked ham hock boiled in my kale. I have found that if I pressure cook the hocks for about an hour or more before I transfer them and all the broth over to a big pot before cooking the greens, it really softens the hard smoked rind of the hock (my favorite part) and the concentrated flavor from the pressure cooking broth adds to their final deliciousness. I often boil my hocks before I add the greens, too! It really adds more smoky flavor. You are making my day with these comments!! Thanks, Nicoal! When does the onion go in? Hi, I’ve never made Collard greens and decided to try your recipe. I have one question do you drain the water before or after adding the vinegar? I’m excited to try the recipe. Don’t drain them until ready to serve, so you’ll add the vinegar before. But don’t get rid of that juice. It’s the pot likker and it’s chock full of vitamins, minerals, and FLAVOR! Has anyone tried cooking them in a slow cooker? If so, how long at low setting? I would start with 4 to 6 hours on low. After I add the greens so i bring the heat down to a boil? I’m a northerner living in the south. Trying to cook like a southerner for my husbands fmaily. That’s it! Hope y’all enjoy! I couldn’t find a smoked ham hock, just a regular one. Think I should add a drop or two of liquid smoke? This will be my first time cooking collards, I grew up eating Creasy Greens. Excited to give these a try! I think the smoke flavor is an important component. Just watch out. That stuff can be potent! 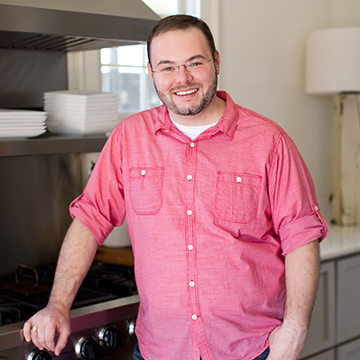 I’m so glad to finally hear another Southern cook who doesn’t put sugar in all the vegetables!! I may be the only person in the South other than you that does not put a spoonful of sugar into every vegetable I cook! I love your method for cooking greens, and will be trying it out during this holiday! Thank you for your good recipes, and Happy New Year!